Almost every day this past year I’ve been praying a borrowed prayer. 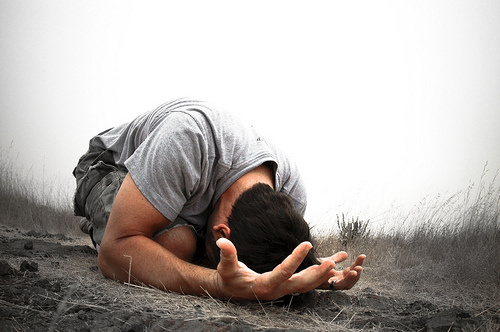 It is a prayer first prayed by a suffering man, a desperate man, a man utterly at the end of himself. It is a prayer first prayed by Jeremiah. Most days this past year I’ve concluded my morning time of prayer with Jeremiah’s cry to God, because it has become my cry as well. Might this become your prayer as well? Jeremiah prays of something he knows and he asks for something he needs. There is something each of us must know. I, you, we, must know that “the way of man is not in himself.” By “man” Jeremiah intends not only males, but “man” as in humanity, mankind. What Jeremiah prays applies to every one of us. When Jeremiah speaks of “the way” he uses a word that shows up often in the Proverbs. Proverbs speaks variously of “the way” of the violent man (3:31), the wicked (4:14), the adulteress (7:25), the fool (12:15), the treacherous (13:15), the lazy (15:19), and so forth. But it also speaks of “the way” of good men (2:20), of wisdom, of uprightness (4:11), of life (6:23), and of understanding (9:6). All of these latter ways are simply individual lanes that make up “the way of the Lord” (10:29). It is “the way” we ought to go, “the way” we are morally obligated to proceed in, “the way” that makes for life, rather than death. Jeremiah similarly speaks of “the way of the wicked” (12:1) and “the way of the nations” (10:2), in contrast to “the way of the Lord” (5:4, 5). He announces: “Thus says the LORD: Behold, I set before you the way of life and the way of death.” (21:8). So “the way” that is not in me, is the way I should go. I can’t live before God as I ought. Whereas the first line confesses the way I ought to go, this line emphasizes way I want to go. Every day, all day long, you and I are taking steps … the moments pass, things happen, words are spoken, encounters with others take place. Life just keeps moving! You and I can’t help but “walk” through this passage of time. But it is not in us to “direct” our “steps” aright while doing so. If I “direct [my] steps” … I’ll do it according to my desires, whims, wisdom. And if I do that, I will inevitably go astray! Again, Proverbs agrees: “There is a way which seems right to a man, But its end is the way of death” (16:25). When it comes to the battle between what I ought to be and what I want to do, each of us must know and admit this: I can’t do this! The word translated “correct” describes correction that is aimed at educating a person toward a better course. It is always motivated by love and is always an evidence of sonship (Prov. 3:11-12; cf. Heb. 12:5-6). A variety of methods may be involved, but it is never merely punitive, but always instructional. The goal is not merely to shape ethical behavior, but to capture the heart for the Lord (Prov. 1:7). “Correct me, O Lord” is a dangerous prayer. Are you willing to pray it, regularly? “Yes,” but I quickly add: “But be gentle with me, Lord!” Correct me … “but in justice; not in your anger, lest you bring me to nothing” (24b). I have to admit, this part of the prayer bothered me for a while. Even as I prayed this prayer over and over, this part just didn’t sit right with me. I wondered, “Why justice rather than grace or mercy or patience?” I would much prefer grace and mercy to “justice”! I came to realize that this prayer enables me to humble myself and pray, as I so desperately need to, “Correct me, Lord, but gently, graciously, lovingly, strongly!” It is perhaps the most basic prayer of a disciple, a learner after Christ. It is my lifeline to Him who alone has all I need and who is all I really want.